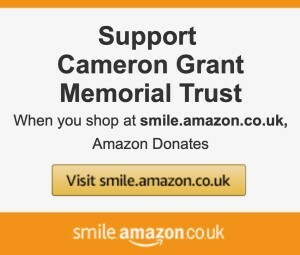 Amazon will donate 0.5% of the net purchase price (on eligible purchases*) to a charity of your choice when you purchase through AmazonSmile.Please support us by selecting Cameron Grant Memorial Trust as the charity you support on AmazonSmile at this link. Then, when you next want to shop at Amazon, go to smile.amazon.co.uk. You will get exactly the same selection of products and low prices as on amazon.co.uk, while, at no cost to you, Cameron Grant Memorial Trust will receive 0.5% of what you spend* direct from Amazon. There are no AmazonSmile apps. If you normally shop through an Amazon app, add items to your shopping basket as normal, then switch to a browser, and login at smile.amazon.co.uk. Your shopping basket will be there, complete with items added from the app; so long as you go through checkout at smile.amazon.co.uk in your browser, CGMT will still get the 0.5% donation from Amazon. * For eligible purchases Amazon donates 0.5% of the net purchase price (excluding VAT, returns and shipping fees) of eligible purchases. Nearly all purchase are eligible; Gift Cards and similar are excluded. AmazonSmile is the same Amazon you know. Same products, same prices, same service. You shop. Amazon gives. To learn more about AmazonSmile click here.